2002 Kubert School graduate Kevin Mellon, has been nominated along with four of his coworkers for an ANNIE Award. ANNIE's are awarded for achievement by the International Animated Film Society. Kevin, who works as a storyboard artist for Floyd County, the production company that produces the animated series ARCHER, for FX Network was nominated in the Outstanding Achievement, Storyboarding in an Animated TV/Broadcast Production, category. Adam Kubert is interviewed about his latest project from Marvel, ORIGIN II. Our own Tyler Champion, Class of 2010 was a featured artist on the website Super Punch. Class of 2011 graduate Carli Ihde is making her mark on the world. Recently Carli's art was featured on actor/director Joseph Gordon Levitt's website hitRECord. The website is a place for artists, musicians, and creative types to come together and collaborate on projects. Instructor Marco Cutrone is pressing all the right buttons! Kubert School painting instructor Marco Cutrone's latest creation is a large scale portrait made with 20,000 upholstery buttons. 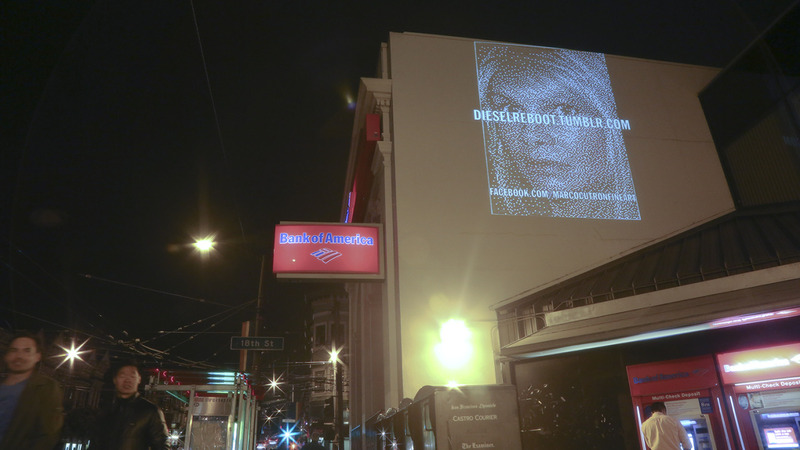 Cutrone's piece also also won a competition sponsored by Diesel Reboot, which had his work projected on the side of a building in San Francisco's Union Square. JUNE 19, 2013 FLEMINGTON - The 2013 NJ SUPERHERO WEEKEND AND WONDER WOMAN DAY to benefit SAFE in Hunterdon will be hosted by Comic Fusion on October 5-6 in Flemington’s Turntable Junction shopping village. Comic Fusion will auction superhero sketches to raise money and awareness for this domestic violence charity. Since 2007, Comic Fusion has raised close to $50,000 for SAFE in Hunterdon. This has been made possible by tremendous volunteers and companies such as Dark Horse Comics, Del Rey/Random House, Universal Studios, Diamond Select & Diamond Toys, Tonner Dolls, and many talented comic book creators. This year Comic Fusion welcomes to the store guest artists Jamal Igle (MOLLY DANGER, SUPERGIRL, KISS), Ken Haeser (THE LIVING CORPSE), and Mike Lilly (BATMAN, CATWOMAN, NIGHTWING) and even more guests to be announced. Comic Fusion will also host the STAR WARS costuming group, the 501st Empire and the Rebel Legion along with Wonder Woman and many other costumed superheroes who will gladly pose for pictures. The art sketches are auctioned with bids taken via email and in person at Comic Fusion. There are also raffles and door prizes. “Comic Fusion is excited to host Super Hero Weekend in our new location in Turntable Jct! Our new location is bigger and will allow us to host more artists! Our Courtyard is more open and will give our Super Heroes lots of room to move around pose for many different pictures with their fans! And we will have an entire wall devoted to displaying the sketches we get from the wonderful artists who donate to this much needed charity event! Everyone who comes to this event is a Super Hero in our books!” said Stacy Korn, co-owner of Comic Fusion. October is Domestic Violence Awareness Month and the comic industry brings awareness about issues of domestic abuse through annual fundraisers like NJ SUPERHERO WEEKEND AND WONDER WOMAN DAY. Domestic Violence Awareness Month grew from the original 1981 Day of Unity conceived by the National Coalition Against Domestic Violence. Comic Fusion is an independently owned retail shop of comics, gaming and collectibles located in Flemington, New Jersey. They have organized an annual event to raise money and awareness for SAFE in Hunterdon since 2007. SAFE in Hunterdon is a valuable community resource that provides transitional housing, 24-hour counseling, crisis intervention, legal advocacy and a children’s art therapy program for those affected by domestic abuse. 2011 Kubert School grads Gavin Smith and Tim Yates are working on Blue Juice Comics time traveling book THE ACCELERATORS. Gavin provides the art and Tim provides the color. There's an interesting video on Blue Juice's website that takes a look at Tim's coloring process. Paul Walcott, one of our talented third year students has been busy drawing and on Tuesday, August 6th he’ll have an open reception for his artwork on display at 8 TO 8 Barber Shop in West Orange, New Jersey. 8 TO 8 is an award winning Barber Shop located at 2 Northfield Avenue in West Orange and the event kicks off at 6 p.m. Previously 8 TO 8 has hosted comic book signings and martial arts demonstrations. 2011 grad Tony Vassallo has just completed artwork for The Monster Hunter International Employee's Handbook, a role playing game created by author Larry Correia and based on his popular novels. the game received funding through Kickstarter and will be available from HERO Games soon. 2011 graduate Sian Mandrake is teaming up with her father, Kubert School instructor Tom Mandrake on the art for the graphic novel Blood Kiss. Sian will be handling the coloring chores on the project. Written by Michael Reaves, Blood Kiss is based on a film which was recently funded through the crowd sourcing website, Kickstarter. Sian also recently completed work on Topps, Star Wars Galactic Files 2 card set. Class of 2013 graduate Max Fuchs is inking issue #7 of Hell Yeah published by Image Comics. Written by Joe Keatinge the Image series is drawn by another former Kubert School student, Andre Szymanowicz. 2011 graduate Derek Chase and his partner Julia Schachter, created the logo for New Jersey's Stage Door Productions. The duo also created the logo and poster for the musical performance, The Beatles & The Beach, to be presented Saturday, July 20th at the George Street Playhouse in New Brunswick, NJ. Derek and Julia will have artwork available for sale the evening of the performance. Congratulations are in order for the graduating Class of 2013. On May 22nd we celebrated with the thirty-fourth graduating class of The Kubert School. Sixteen students completed our three-year course and were lauded at a ceremonial dinner. This year's guest speakers were comic book industry powerhouses Jimmy Palmiotti and school alumnus Amanda Connor, who spoke about their experiences in the industry and offered humorous but sound advice to the students beginning their own careers. Check out the student's work by following the Graduating Class link at the top of the page. Instructor Todd Doney who teaches Methods and Materials to our second year students is featured in an exhibition at the Morris Museum located in nearby Morristown, New Jersey. NATURE SUBLIME is an exhibition of over twenty of the the artist's large scale landscape paintings completed in oil paint. The exhibition runs through June 23rd. 2007 graduate Joe DellaGatta's art is featured as part of Multiversitycomics.com's 31 days of Abe. This is to promote their Evolution of Abe Sapien contest. The BEAT interviews our own Fernando Ruiz! Fernando Ruiz is one of our schools most popular instructors and he gets a great write up from Hannah Means-Shannon at THE BEAT. Kubert School attending the MOCCA Fest on April 6 & 7. Kubert School attending C2E2 on April 26 - 28. September 14, 2013 - Adam Kubert attending the Montreal Comic Con. TWO BROTHERS and a very talented sister. Class of 2012 graduate Brigid Allanson's artwork graces the cover of the latest issue of PURE NINTENDO magazine. Penciled and inked by Brigid and colored by 2011 grad Tim Yates, the cover features a character from the game TWO BROTHERS which is coincidently, a game developed by Brigid's own brothers and their Ackk Studios. Brigid is also creating the artwork for a comic book prequel to the game's story line and there is a preview of the comic in the magazine. Fun Fact: Brigid's parents met while attending The Kubert School. Jackie Winston, a 2007 graduate has been toiling away in the game industry for several years now, working on games like Teddy Tumble, a game app for iPhones and iPads. This past year Jackie launched her own web comic THE BEST BER featuring her charming illustrations and the exploits of The Best Ber and his efforts to always return the container. Five Ghosts, a six issue comic book series with art by 2010 graduate Chris Mooneyham and written by Frank Barbiere has been picked up for distribution by Image Comics. Originally self published and successfully funded as a Kickstarter project, Five Ghosts is the story of adventurer Fabian Grey and five very familiar ghosts whose powers he can harness in times of need. Former student Dave Chenet is the driving force behind Dare 2 Draw a monthly meet up group in Manhattan that promotes the artistic comic book community. 2005 graduate Jerry Wilson was recently promoted to Lead Artist for High 5 Games social projects. His current project, High 5 Casino has over a million active users and is the top trending app on Facebook. Since graduating Jerry has worked with clients like Disney, Dreamworks, Hasbro, Nintendo, Nickelodeon and Mada Design.